Another quilt finish! I took the last few stitches in the binding on this one just before I had to leave to deliver this quilt to the quilt show for this weekend’s quilt show. My version of this quilt continues the same fabric across the quilt from left to right, unlike Bonnie’s scrappier version where the fabric choices change for each block across the quilt. 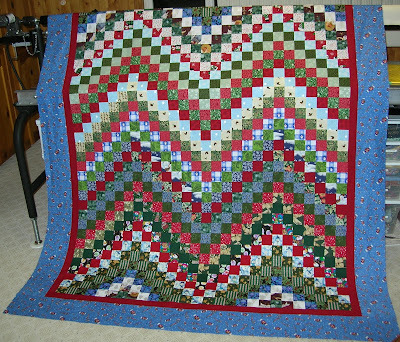 Since my quilt is made from Christmas fabrics, I am calling my version Christmas Bargello. Linda and I finished our quilts to the flimsy stage early this year and I quilted mine on March 15 and Linda’s on March 22. Linda was faster to finish off her binding. http://catsnqlts2.blogspot.com/2009_03_01_archive.html I guess I needed a deadline like the show to prompt me to finish off the last few feet of binding. Today was Superbowl Sunday. We aren’t NFL fans in this house so the game was not on here. 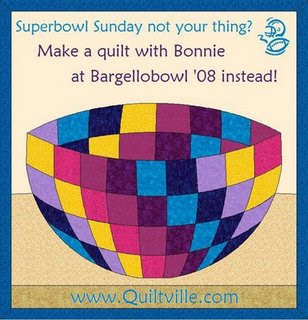 However, after LindaJ suggested that we take this Sunday to play along with the many bloggers that were quilting on Superbowl Sunday and making Bonnie’s Scrappy Bargello quilt, I was in. LindaJ and I spent a couple of evenings during the week chatting on line about the pattern, what fabrics to use, what size to make the quilt, etc. We both fell in love with a couple of versions of Bonnie’s pattern that were completed in Christmas fabrics by KarenO and by Marcy Brower. 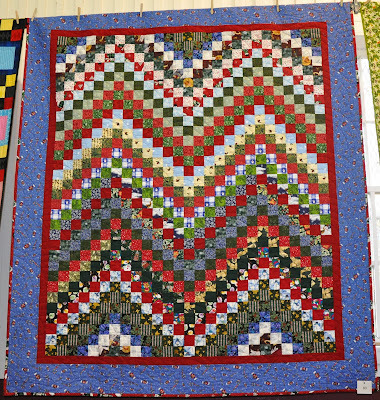 LindaJ and I definitely like the idea of using the same fabric right across the quilt so that the “wave effect” is prominant. When I looked in my Christmas fabric bin, I found a stack of strips already cut to 2 1/2″ wide. I am not sure why I originally cut these fabrics but since they were already cut and waiting, I decided to put them to use. I needed to add a few more greens and reds to ensure that my quilt looked like a Christmas quilt and I was ready to go this morning. LindaJ decided to make her version in scrappy fabrics. Since LindaJ intends to keep this quilt for herself (rare since she donates most of what she makes to charity), she has included fabrics received from on-line friends. We had a family dinner to attend tonight at my SIL’s so I had to stop working on this quilt about 3:00 in the afternoon. At that time I had completed the first strata and I had three seams to sew to complete the second strata. A good start to this project. This is a picture of the first strata. It is always great to sew along side a quilting friend — even if that friend is in cyberspace — so you have someone to check with when directions are unclear. Thanks for the assistance with the pressing directions, LindaJ! I know from previous projects that if the seams aren’t pressed the correct direction in the first place you can create a lot of extra work and frustration later on in the project. Hopefully, we can complete our tops together next weekend if we can get all the other obligations in our life organized and out of the way!